302 pages | 32 B/W Illus. Most public policy analysis books currently on the market are US-centric and focused on quantitative analysis, while comparative public policy textbooks are oriented around countries and specific policy processes. International Public Policy Analysis is the first textbook to take a truly comparative and cross-cultural approach, organized around policy issues, to examine important policy ‘lessons’ that affect the everyday lives of citizens. Authors George Guess and Thomas Husted demonstrate that incremental, marginal changes in sectoral policy systems using cross-national lessons can lead to larger changes in country policies, democracy, and better governance. While whole-systems policy transfer without major adaptation to local cultural and institutional contexts often does not work, many opportunities exist in each sector for operational-level piecemeal transfer of lessons and practices to improve policy performance. Jargon-free and using a cross-cultural approach, the individual chapters in this book utilize a 3-level analysis to review the policy issue areas, present analytic tools and frameworks, and provide cases/exercises for practice in applying the methods and frameworks. 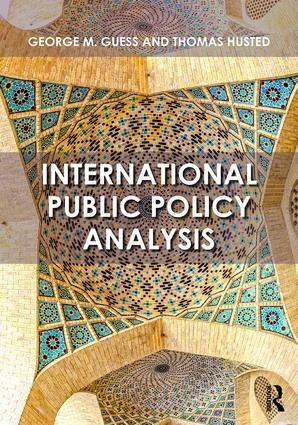 International Public Policy Analysis is an essential upper-level undergraduate and graduate textbook for courses on comparative public policy, policy process, political economy, and international policy analysis, and may also be used as required reading in introductory public affairs and policy courses at the graduate level. George M. Guess is Adjunct Professor in the School of Policy, Government, and International Affairs at George Mason University, USA. Thomas A. Husted is Professor and Chair of the Department of Economics at American University, USA.